Jay and I really do love our life. I’ve said before that resorting isn’t for everyone and that’s true. Some people think we’re lucky because we get to go fishing “whenever we want” in the summer. In reality we rarely get time to ourselves in the summer and we NEVER take a full day off (let alone a weekend) between May and the end of September. However, yesterday I was thinking about our wierd life as we drove out of Wildwood on our snowmobiles at 8:30 a.m. on a Friday morning. It feels strange to take our recreation days when the “normal” business world is hard at work but it’s days like yesterday that make the seasonal craziness of our summer so worthwhile! 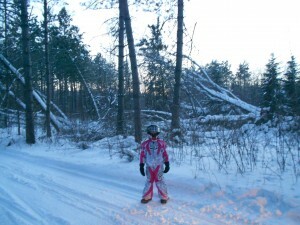 We literally rode our snowmobiles ALL day and explored lots of trails we hadn’t ridden yet this year. We had a great day and have some stories to tell, too, so that makes it more fun. We hadn’t ridden out of Wildwood yet this winter so yesterday we left the resort heading east on the Bushwacker. 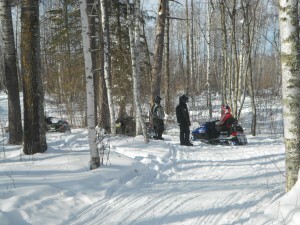 We picked up the Taconite snowmobile trail north of Grand Rapids and headed north. The day was gorgeous!!! We definitely haven’t had as much snow in the Grand Rapids area as they’ve had to our north 30 miles. However, the Bushwacker was in good shape and had been groomed. We were anticipating a very fun ride on the Taconite Trail and were just a little bit disappointed that it hadn’t been groomed because it was pretty rough. That trail gets TONS of traffic and I’m sure the DNR has been out grooming but it was a little rough with corners pretty dug out. The DNR is rating the trail condition as “Excellent” and groomed I’m sure it is excellent. We couldn’t take too long of a ride yesterday since the school district does expect us to pick up our kids at the end of the school day (!!) but we still had time for a trip north to a favorite lunch spot, The Scenic Pines Bar and Grill. The Swampsiders Snowmobile Club does a GREAT job taking care of their trails up there and as I’ve said before it’s a favorite place for us to ride. 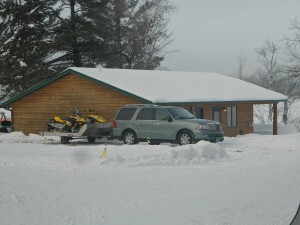 Lots of great places to stop and rest on the Taconite Snowmobile Trail! After lunch we went outside to the sleds and I realized that I was missing the bag I always carry on the back of my snowmobile. I thought I remembered carrying it out of the house that morning but, frankly, my memory ain’t what it used to be so we decided that I must have forgotten it. I jokingly told Jay and our friends, Tim & Karen, to keep their eyes open for my bag as we headed for home back down the Taconite. At this point I’d like to say that one of the things I really like about the Taconite Trail besides the wide trail and roller coaster hills is the number of bathroom stops on the trail. Now I’m not saying that I need so many bathroom breaks but some people might and I’m just saying that those people (not me) might be happy to see an outhouse if they’ve had too much Pepsi with their lunch. Anyway, we had gotten almost back to Grand Rapids when I came over a hill and saw our friend, Tim, chasing his snowmobile down the trail. In general I’ve learned that it’s not good if your snowmobile is still going down the trail without you on it. (However, it IS very funny to watch someone else running after their snowmobile…) Tim has an eagle eye for interesting things on the trail and as he sped by a trail sign he saw that some good Samaritan had hung my bag on a trail sign. He hit the breaks a little too hard and as a result of ill-advised braking he “dismounted” unintentionally. I topped the hill just in time to see him trying to catch his sled before it hit a tree! I would have taken a photo of that bag hanging on a sign but I was too busy laughing! Oh my, that was funny…if only I’d had one of those helmet cameras recording video at the time!! By the way, not one thing was missing from my bag. How nice!! 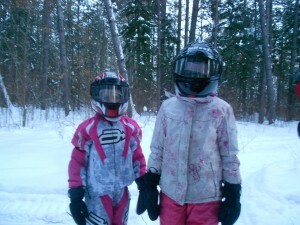 We had fun on the snowmobile trail with our girls last night! However, riding through the blow down area last night was amazing in a very unpleasant way. I’ll try to get better pictures next time we ride in that direction. The ride was 30 miles from Wildwood to Gosh Dam Place. We had a great dinner and rode home through a moonless night with the stars out in full force! It was gorgeous! The eastbound trail of the Buschwacker between Deer River and Cohasset isn’t a favorite. Lots of it is riding the angle of the ditch and with last night’s warm temps it was challenging to keep from sliding down the hill into the deeper snow. However, it’s only about a 10 mile stretch so it’s only a small part of an overall great ride! 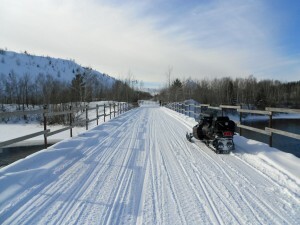 The Grand Rapids, MN area is a great destination for Minnesota snowmobiling right now…our conditions are great! 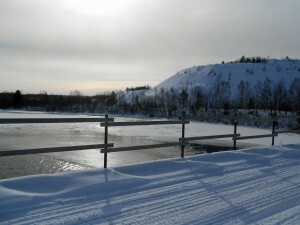 We do have some ice fishermen in this weekend so hopefully we’ll have an ice fishing update for next week’s blog. And x-ski trail conditions are great from everything we are hearing! The Grand Rapids, MN and greater Itasca County area is a great destination for a winter weekend getaway! Check out the Visit Grand Rapids webpage for a listing of events in our area and make plans to head north. We’ll see you on the trails! P.S. About our eagles: last weekend a neighbor stopped by to let us know that he’d seen an eagle on the shoreline just north of the resort with an injured wing. We called our local Conservation Officer and she was able to capture the eagle which indeed had an injured wing. She let us know that the eagle was on its way to the Raptor Center in St. Paul. Jay and I are praying it wasn’t one of “our” next door eagles. We’ll let you know what we find out! 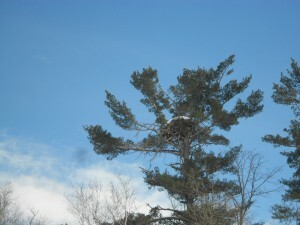 From the snow cover on their front deck it looks like our resident eagles might be enjoying warmer climates right now. They always leave for a short while in the harshest part of winter but we’re hoping to see them back soon!